WHEN THEY'RE GONE THEY'RE GONE... DON'T LET THIS GET AWAY. Grace Snowboard is all about style, performance, and fun. Shaped for ladies, getting better by the day now becomes better by the hour, the RIDE. Grace Snowboard is lightweight, fun and easy to turn. Featuring the flexibility you need to stay in control as you learn, the extra pop you want as you get better and relaxed graphics to channel your tranquil cool, the RIDE. Grace Snowboard will take you anywhere you wanna go. This is a perfect board for riders trying to take their skills to the next level. Construction and Core: Foundation Tuned Core, tip-to-tail wood core thats got pop, proven durability, and wont loss its camber or flex // Linear Carbon laminates along the core, more snap for a powerful pop off the tip or tail. Shape: Camber, directional twin, this board will give you plenty of pop and control whether youre riding regular or switch // Radial sidecut, one radius along the whole board for smooth and predictable turns. Sidewalls, Edges and Base: ABS Sidewall, responsive ABS alloy thats durable // Biaxial glass, 90° to 0° angles, lightweight, fun and forgiving // Fusion 1500 Base, easy to repair, wax absorbing, proven durability // Standard Steel Edge: Rockwell 48 C // Performance edge tuning, features 2° and 3° base bevels tuned for smooth turn initiation and confident Riding minus the edge catch. Tip Width: 280.4mm (146), 283.2mm (150), 286mm (154). Waist Width: 238mm (146), 240mm (150), 242mm (154). Tail Width: 280.4mm (146), 283.2mm (150), 286mm (154). Ability Level: Intermediate - Advanced. Effective Edge: 1132mm (146), 1158mm (150), 1183mm (154). Rider Weight: 80-140lbs (146) // 90-160lbs (150) // 110-170lbs (154). Sidecut Radius: 7300mm (146), 7500mm (150), 7700mm (154). JUST BOUGHT IT FROM A LOCAL RETAILER. May SHOW SOME VERY MINOR SCUFFS/SCRATCHES FROM BEING ON DISPLAY IN A RETAIL ENVIRONMENT, BUT BE ASSURED THIS BOARD HAS NEVER HAD BINDINGS ON IT , AND HAS NEVER BEEN RODE. 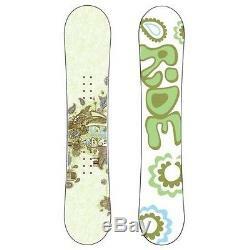 The item "NEW RIDE GRACE SERIES 154 CM SNOWBOARD SNOW BOARD WOMENS FREE SHIPPING LADIES" is in sale since Friday, December 16, 2011. This item is in the category "Sporting Goods\Winter Sports\Snowboarding\Snowboards". The seller is "mateofmilk" and is located in Saratoga Springs, Utah. This item can be shipped to United States.